Unfortunately the developers of the Windows port for the popular torrent client Transmission had decided to close this project on SourceForge.net – the place where the development of the application was publicized. Too bad – it was and still is a fast, reliable and simple torrent client for Windows. It is the fastest torrent client that popped-up in the recent years and it’s really a pleasure to use it (as an alternative to BitTorrent or μTorrent) because it just works and it does not slow down the computer. Why use Transmission on Windows? It has all options required to handle the job of downloading torrents. 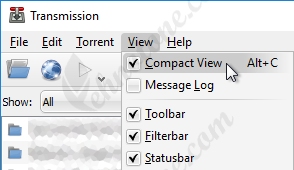 If you want to squeeze more torrents into view you might want to choose Compact View option from the View menu or by pressing Alt+C. This will squeeze about tree torrents in the space of one (as in normal view). The text will be smaller and some information about the torrent will be hidden but the most important bits will remain visible. Open Transmission Qt for Windows and go in to Preferences (Edit menu > Preferences). Select Downloading tab then check the box Move the .torrent file to the trash. Now you don’t have to clean-up after. Other useful options to be enabled are Automatically add .torrent files from:, which coupled with the option described before will enable the full automation of handling the .torrent files. The target directories can be customized for both options. Copy a shortcut to Transmission Qt in to this folder to enable the automatic startup.